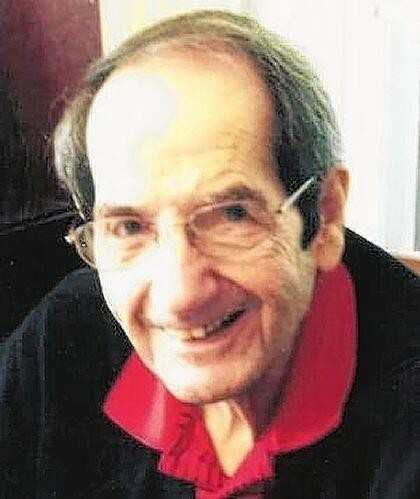 WEST WILLIAMSON, W.Va. â€” Jimale Jimmy Madlom, age 88, of West Williamson, passed away peacefully Saturday. November 26, 2016, at Williamson Memorial Hospital. Born February 22, 1928, at Williamson, he was the youngest child of the late Mohammed Ali Mike Madlom and Ida Curnutte Madlom. Jimmy was preceded in death by his wife, Martha Pauline Farley Madlom, and his brothers, Mike Madlom and Emmet Madlom. Loved by his family and friends, Jimmy was charming, witty and warm. He shined bright in the company of his family and friends, including the several lifelong friends who were as close as brother. He was admired for his ability to tell a funny story, usually one that gently teased someone he loved. He had a sense of style about him and was always sharply dressed. Jimmy grew up in Williamson and graduated from Williamson High School. He was a member of the drama club and often played the lead role in school plays. At ease in front of a crowd, he was often asked to say a few words or give a toast at a special event. He was invited numerous times to be the master of ceremonies for Marshall University events. As a youth, he worked in his familys business, City Restaurant. He left Williamson when he joined the U.S. Army and was stationed in Occupied Japan. While there, he played basketball on the U.S. team. He returned from his service battling tuberculosis and spent 18 months in a VA hospital in Oteen, N.C. Back in Williamson, Jimmy and Pauline married in 1951. He began working at the Price Motor Company and was a successful car salesman for more than 30 years. When the company closed, he went to work for Mingo Bottling Company. Jimmy was a member of the Williamson Elk Lodge, the Moose Lodge, the Mountain Club, the American Legion and he was both a Mason and a Shriner. He was also a member of First United Methodist Church. He was an athletic man who played a good game of golf, twice earning the title of Club Champion at the Tug Valley Country Club. He could run the table in a game of pool and was an excellent bowler. He was batboy when famed St. Louis Cardinal Stan Musial visited Williamson and they later became friends. Jimmy's health began to decline in the past two years and he was welcomed into the home of his daughter, Toni Leigh Harris and her husband, Jeff, and their family. He was surrounded by love and enjoyed the energy and joy of his adorable three great-grandsons. The Harris family pulled together as a team to help care for Jimmy and make him comfortable and happy. Jimmy is survived by his daughter, Toni Leigh Madlom Harris and Jeff Harris; granddaughter Holly Leigh Harris Dyer and her husband Caleb; a grandson Chris Harris and his wife, Marquita Harris; and three adorable great grandsons, Brady and Hunter Dyer and Hudson Harris, and twin great-grandsons on the way. He is also survived by his sister, June Tootsie Madlom Blevins and nieces Bobby Gayle Corea, Beth Ann Blevins, Judy Madlom and Kim Madlom; and nephew Mike Madlom. Jimmy was blessed to have had two beautiful women in his life, his wife, Pauline, who passed away in 1989, and in his later years, Lorraine Gentile Sherman, whom he had known since childhood. The two shared many good times together and with her family of five daughters and their spouses and children before she passed in 2014. Visitation will be from 6-9 p.m. Wednesday, November 30, at Weaver Mortuary at West Williamson. Funeral services will be conducted at 11 a.m. Thursday, December 1, at the mortuary. Reverend Jerry Shields will officiate. Interment is in Fairview Cemetery at West Williamson. Military Rites will be conducted by the Disabled American Veterans Chapter 141 at Belfry, Ky. Masonic Rites will be presented at the graveside as well. Family members and friends will serve as pallbearers. Honorary pallbearers include Dee Gentile, Gary Davis and Jerry Lambert. In lieu of flowers the family asks that memorial contributions be made to the Williamson First United Methodist Church, 101 West Second Avenue, Williamson, WV 25661. You may express online condolences at www.weavermortuaryinc.com. Weaver Mortuary at West Williamson is serving the Madlom family.